Benefits that sales intelligence can bring to your nurturing and development process. Four major categories of sales intelligence technology. Top vendors to compare in each category. 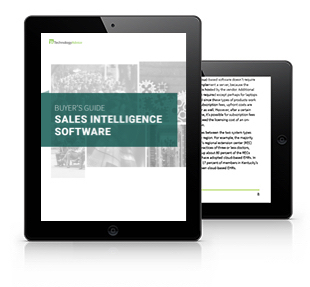 Sales Intelligence case study, featuring Everwise and InsightSquared. The modern sales cycle is long, complicated, and driven by decision-making groups with conflicting priorities. If you’re shopping for sales intelligence software, you’re probably looking for insight that will help you reach buyers more effectively and create revenue faster. Admirable on both counts, but the sales intelligence vertical is still young and undefined; vendors are still vying for marketing dominance and struggling to establish a standard definition of both the technology vertical and the business best practice(s). It can be extremely difficult for first-time buyers to compare sales intelligence solutions and decide what’s right for their business. This guide will help you better understand what sales intelligence software can offer, how your business can use it, and how to narrow your search. We’ll also highlight a sales intelligence case study and some of the leading solutions in four different categories.